Solar energy and especially community solar is something that we are starting to hear very often. If you are confused about what community solar is then let’s try to help you understand what it is. Consider a community garden, where anyone can come to grow vegetables, fruits or even flowers and plants. Basically, a shared local space that provides the people within the community organically produced food. Now just imagine this same scenario with the vegetables and fruit produce replaced with solar panels. This is what is known as community solar, wherein the solar panels generate clean energy to power nearby houses as well as equipment (oven, lights, computers etc.) within a community. Now that you have understood what community solar is, it is important to understand the benefits of being part of the community solar. As mentioned before, the major benefit lies within the fact that anyone can be a part of the clean energy revolution by adopting community solar. Apart from this, another major advantage is in terms of finance. With the help of the Virtual Net Metering (VNM), the community solar option seems feasible to people who otherwise cannot afford a solar farm or have funds required for installation. Virtual Net Metering system allows people or businesses to receive Net Metering Credits that is directly related to any renewable energy project. These net metering credits are worth as much as or are equal to the cost of energy utilized from the utility company. This concept can be a little confusing and so I am going to explain with the help of an example. Imagine you are a participant in the community solar and a share of your solar farm is 5 kWh (kilowatt/hour). This means that you will receive net metering credits worth 5 kWh and this will reduce your energy bill by 5 kWh on a one-on-one basis. The excess energy in any case of underutilization of the energy is fed back to the solar farm. 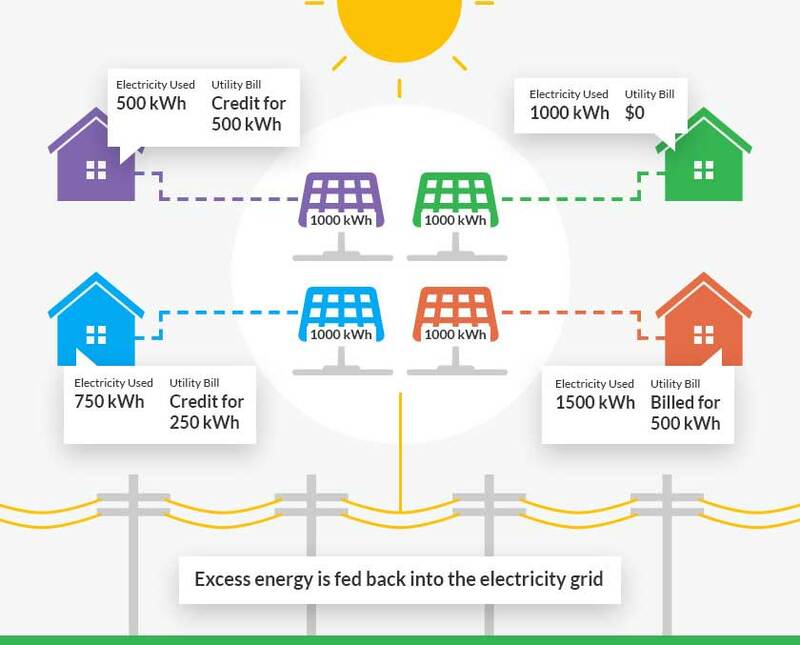 As you can see in the image above, it is very evident that Virtual Net Metering system provides obvious financial benefits to the participants of the community solar. Apart from finance, the other benefits of community solar include environmentally friendly, as if more people start adopting renewable energy it will help sustain the world’s resources. It is indeed promising support for low-income households, as they will now be able to be a part of sustaining the earth, and the costs associated with using this energy is relatively low. Other than this, it is also a good investment as now, due to the low cost of solar farms, small local governments as well as powerhouses can be a part of this program and generate revenue. How to be a part of the community solar program? After understanding the benefits associated with community solar, the next question people generally have is “how do I become a part of this program?” There are two types of participation plans for the community solar program, which is explained in detail in this section. Not-for-profit: donors support a renewable energy farm that is owned by a not-for-profit organization by purchasing the energy generated from one or more panel. Special purpose entity: in order to benefit from tax incentives, individual participants come together to launch a business endeavor wherein the share a renewable energy project. This is a popularly adopted plan by affluent customers, as it makes it easier for people who cannot otherwise install rooftop solar to now have a solar farm of their own, provided they have the funds required. Though this model seems attractive, it sometimes hinders people from low-income households to be a part of the program, as owners tend to block out the panels. In this participation plan, once a utility company builds a solar farm, they offer members a chance to participate and gain benefits from renewable energy. This model does not require any upfront fees to be paid in order to be a part of the program, but it requires that participants must reside within the third party utility company’s area. This program, however, allows free and easy entry of participants unlike in the case of ownership project. In the case where a participant decides to leave the program, his/her spot will be open and available for another interested participant. This is the program that is most popularly requested by members as it holds economic as well as environmental benefits for the community. Community solar has definite pros and cons, cons such as the fact that it requires an appropriate area for the farm to be installed. The solar farm cannot be installed in a place where the sun does not shine, and the land space required is quite expansive as well. Apart from this, it also requires a lot of money and time to be built, making it a little tricky for companies as well as participants to consider investing in. However, as mentioned above the benefits of adopting this renewable energy source will definitely prove to be healthy as well as help in sustaining the earth. It is growing in popularity because people and companies are willing to take a step in adopting renewable energy and avail the benefits associated with it. Author: Amit Bajpayee is a Solar Energy Adviser and nature lover, currently working with Agni Solar. He is a passionate writer and love to write on topics related to renewable energy and solar industry to help people improve their solar energy knowledge and stay update continues.